Please note: Individual Doors titles are not numbered. Only the Infinite 45 RPM LP and SACD box sets are numbered, and limited to 2,500 copies. Please also note, Waiting For The Sun is presented in 5.0 not 5.1 surround. The album doesn't contain any content on the subwoofer channel, as during the creation of the multichannel mix by Bruce Botnick, The Doors producer/engineer, he deemed a .1 track unnecessary — "During the mix I felt that it wasn't necessary as the tracks had all the punch and bottom that we needed to tell the story." 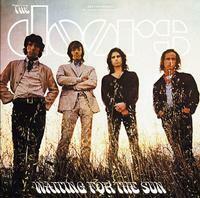 Waiting For The Sun was also some of The Doors’ most combative, political work. "The Unknown Soldier" was a barefaced antiwar attack, a reaction to the Vietnam-era hostilities brewing on the home front. Analogue Productions and Quality Record Pressings are proud to announce that six studio LP titles — The Doors, Strange Days,Waiting For The Sun, Soft Parade, Morrison Hotel and L.A. Woman — are featured on 200-gram vinyl, pressed at 45 rpm. All six titles are also available on Hybrid Multichannel SACD! All were cut from the original analog masters by Doug Sax, with the exception of The Doors, which was made from the best analog tape copy. Click here to read a 1997 interview in The Tracking Angle with Doors producer/engineer Bruce Botnick. If you like The Doors then stop reading this review and just start buying these Analogue Production SACD releases, they sound great. In fact, I'm going to stop writing this now and go buy the remaining discs ("The Doors" and "The Soft Parade") that I didn't buy originally because I already had early vinyl editions. Loved it. Sounded better than ever in 5.1 surround. Great buy!